Our clients can avail a range of Mazak Slant Turn. This range of CNC machines is manufactured by using the advanced technology and superior-grade raw material, at trust-worthy vendor-base. Furthermore, these machines are fabricated in compliance with the highest quality standards and norms. Founded in the year 1986, “D. P. Enterprises, New Delhi” are the well-recognized importer, exporter, supplier, buyer and trader of Industrial Process Machinery. 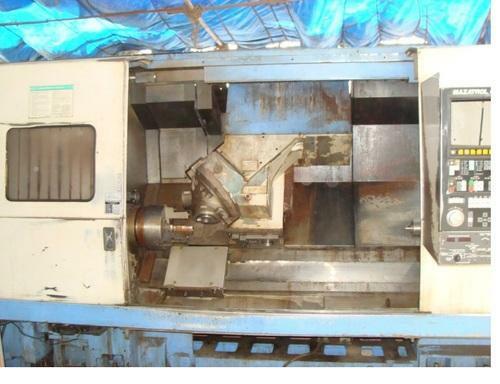 Offered range contains Gear Machines, Gear Machinery 2 and CNC Machines. The offered products are obtained from the authentic and proficient vendors of the market who design these products using the excellent quality components and technology as per the modern market trends. These products are available in various specifications to meet the demands of shaper, planner, drilling, milling and facing processes of manufacturing industries. Moreover, our products are required by our patrons for its durability, high performance, smooth functioning, user-friendly controls and high productivity. Backed with our highly talented and experienced professionals, we have been able to cater to the precise demands of our customers. By working in close coordination with each other, our professionals avoid any kind of interrupt in the workplace. Moreover, they hold rich industry experience in their area of work which results in effective fulfillment of manufacturing processes of various industries. We are exporting our products in Dubai, Iran and South Africa. Our products are famous in the market with the Liebherr and Fauter brand name.